In severe winters, the ground of North China is covered with ice and snow; while in South China, fireball tree trees still have luxuriant foliages; amidst the twigs and leaves, we can see the flowers are in full blossom and are as red as burning fires. Looking from afar, the flowers are like red clouds, and it is really a wonderful spectacular. In the middle of Spring, the flowers of fireball tree fall on the grounds, and make people recall ancient poems such as �fallen flowers scattering and flying around like snow flakes, and they will protect their offspring after they become soils�. At this time, the young girls of the Dai people would come in groups to pick up the pedals of the flower; they would piece the flowers into bunches and the sight is really fantastic. Tall and green trees, fallen flowers cover the ground, slender Dai girls, and colorful umbrellas are like music coming out of the violin; they are so amazing and often make the people quite excited. 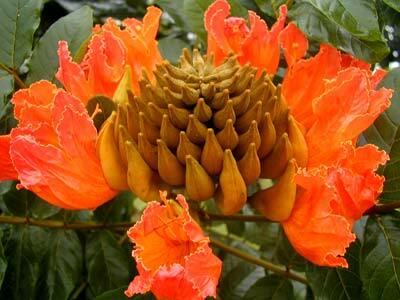 Fireball tree originates in Africa. Its blossom period is in-between winter and spring. The flower pedals are very large and often are as long as 10 to 12 cm. If we observe them carefully, we may find that on the edges of the deep red flower pedals, there is a ring of golden yellow, which is extremely catching to the eyes. The tree is as tall as 10 meters, the canopy is quite large, and so it is often used as sheltering trees or trees planted along roads. They are also suitable for planting in parks, communities and tourism spots.